Betty's love of the water and the ambience of Oriental are expressed in her sketches. She sketches local scenes, homes, businesses, churches, bed and breakfast inns, boats and wineries. 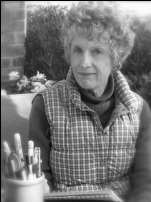 Betty received her undergraduate degree in Fine Arts from Roanoke College, Salem, VA. She also earned a Master's Degree in Special Education from Radford University, Radford, VA. She taught children with Learning Disabilities in Roanoke, VA.
Betty recently completed drawings of the seven coastal lighthouses of NC. Prints and cards of the lighthouses are are now available at The Village Gallery. Betty will come to your location and photograph the project or can work from an existing photo. She takes great pride in the detail of her work and always meets with her clients to go over any changes they may want prior to printing. The original print can be made into artist signed and numbered prints, note cards, Christmas cards and business logos.